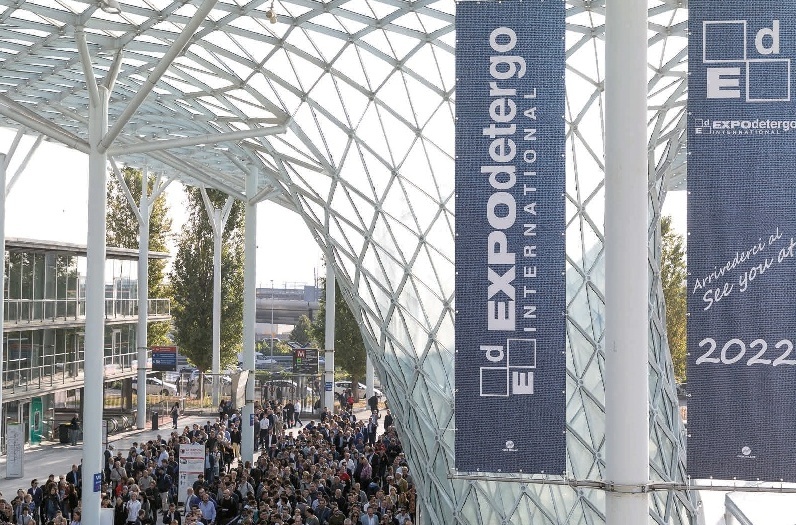 Just like all the great stories teach us, the happy end of EXPOdetergo International starts at the beginning. Where, as we are going to witness, it finds an immediate reflection in the slogan chosen for the show: “We are updating the future”. These words will be confirmed until the very last second the booths were opened. 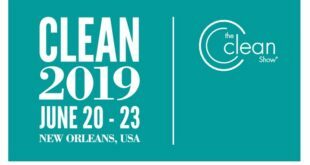 The show revealed to be totally “unprecedented” not only because of its eighteenth edition but also because it proved there is a new way of “doing” laundry. Laundry linked to the latest decade of the acquired 4.0 industry, the birth of Internet of Things and the widespread social networks. 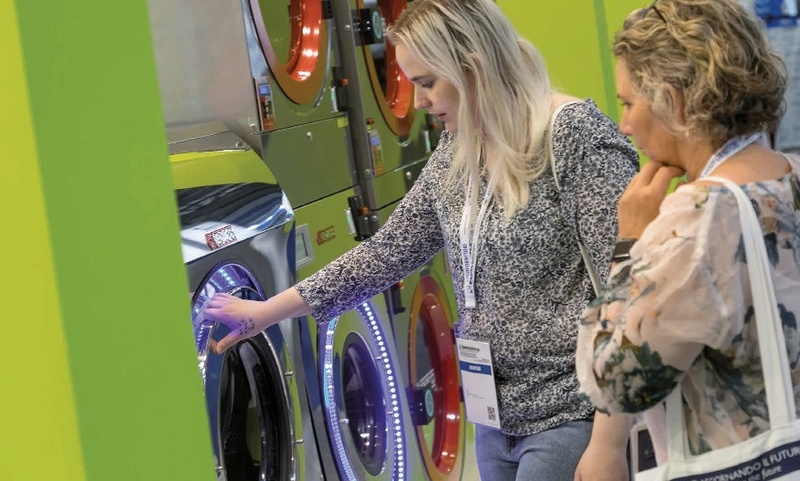 The visitors attended the exhibition held in Milan from 19 to 22 October in order to discover how laundries make the most of the “Tailor Made” concept in 2018. 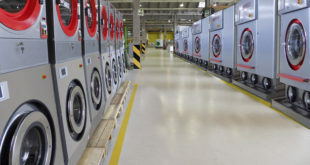 The English expression means customized, “created” for clients’ needs therefore, it reflects establishing business relations with them, let it be a hospital with its linen supplied by a large industrial laundry or the Bianchi family that gets their service from a shop around the corner. This is why, when this global textile care expo got to the end, the final toast sparkled the strongest as the success had widely been announced by the crowd gathered in Fiera Milano on Friday, 19 October at 9,59 a.m. A minute before the show, the happy end could already be outlined by summing up the presence of various signs: not only the number of attendees but also their diverse origins, a melting pot of voices as well as the blue outfits of managers representing big multinational businesses if not the flowery tailleur of Mrs. Loredana who came to the show after she delegated the work to her two entrusted employees at her renowned family run dry-cleaning shop. Right in time to register such a composite group and the turnstiles opened the four days of meetings, smiles, hand-shakes, deals signed, realised projects, prosit, illuminating discoveries, machines running, garments hanging, conferences, theatre plays, momentous decisions, exchanged business cards, unexpected punches and arrangements for 2022. Just what an exhibition should be like. Actually, the “Exhibition” whose name is EXPOdetergo International. Let us live through it day by day. The first image that sticks in the memory while wondering around the “lanes” of the halls is a silent stop of an electrical monocycle. A young man wearing a cocktail party outfit is riding it. He has a photo camera with him and, every time he stops, he takes a few photos of the exhibited goods: washing machines, tunnel washers, trolleys or anything that draws his attention at that very moment. As if somebody, on the other side of the world, commissioned him a service asking to capture the identikit of this highly awaited show. Where, among other things, it is claimed that “the future is updated”. We are asking ourselves if the photographer aims at catching the “mood” of the show with its lively, dynamic atmosphere, at times joyful and very intense. It however, would be a mistake to conform to the speed of the continuous changes of scenes because EXPOdetergo International, apart from its shining façade if multimedia booths, reveals that it is rich in perspectives, connections and “links” to which one can refer. Not by chance, our monocycle rider in motion lets himself be guided by what appears in front of his eyes that tell him where to go and stop, even for five minutes if necessary, so that he can go into detail of the visuals, isolate them and compare. Following his camera track with discretion, we can see the shapes of dry-cleaning machines that can save up resources taking the same amount of time for a washing cycle as its competitors’, ironing tensioning machines able to perfectly iron wet shirts, hydrocarbon solvents recommended for rubber garments or large garment applications. These are only some of the infinite examples of market varieties and new ways. So many that that it is almost hard to recognize what the main one is. The vitality of the industry gets to be confirmed more than once already on the first day of the show. First of all, by the presentation of the research results on industrial laundries and dry-cleaners in Italy carried out by Cerved Institute. With the invitation to read the report on the event in this issue of Detergo, we are glad to underline that the figures presented are all rising, just like 59 cases out of 100 where a client goes to one of the 13thousand dry-cleaning shops in Italy to have their trousers washed and ironed. Figures that, written black on white, find echo in the words by Marco Marchetti, the President of Assosistema, the association that represents businesses dedicated to textile care, and that welcomed the participants at Etsa’s seminar held at the show, a European organization for laundries. 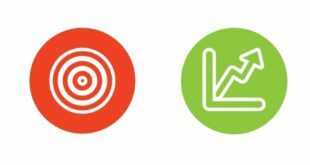 “Our sector is always more and more open to the society – Marchetti explains – present on social networks a lot, observed by some authoritative platforms like Tripadvisor that includes us in the evaluation parameters as far as tourist sites go. We are structurally involved in the functioning of hospitals and assistance institutions daily”. From Italy to the rest of the world, the passage is short. On the opening day of the show, Cinet presents their traditional “Awards”: 49 of them in total. The two main awards go to China, assigned to laundries from Beijing and from Nantong, while the life award goes to Martin Kannegiesser, the CEO of the German Kannegiesser, a producer of industrial laundry machines. Great achievements and personal horizons. It is normal for them to coexist during an exhibition of this type, where every stand triggers some creative thinking or becomes a base for encounters. It is evoked by e.g. a constant line of people in front of machines that treat shoes in every possible way including the dyeing processes that make them look new again just like a-600- euro pair that had become matte after it was wrongly washed in water. Where there is less crowd, visitors try to get in touch with producers directly to investigate into the best suitable solutions. As we will discover it over the next days, he is not the only one who thinks this way. “Did you see how many people came yesterday? ?”, “I do not recall a Friday like this”, “I did not take a break at all over eight hours yesterday”, “If it continues this way, we are all going to break a record”. The comments above compose the “choir” of exhibitors on the second day of the show. Their words mix with teams of participants passing by wearing their orange ties or black polo shirts, or perhaps blue uniforms, all the signs of homogeneity by which visitors can recognize them. Undoubtedly, a small yet, fundamental part of any company mission participating in the show consists of leaving a clear imprint. Being seen, registered in the minds of visitors and perceived as a presence that can be repeated. Everyone tries to accomplish this by any possible means such as a notice board reporting on all the models of the iron types produced over years or a poster that illustrates the advantages of ozone in garments sanitizing. There are those who choose to involve the visitor directly, e.g. Zen style, just like one of the producers of IT systems who exhibits a comics strip: “A cell phone can cost a hundred euros or a thousand. If you know yourself, you know which one is the right choice for you”. The parabola is to be applied to the choice of an IT management system through which it is possible to manage the production worth either 100 thousand euros or one million turnover. 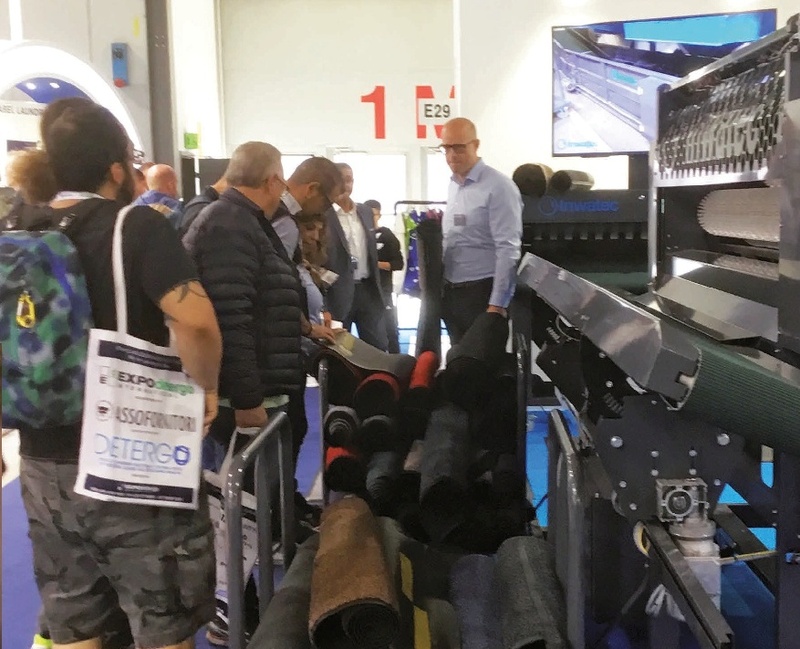 The lesson can be confirmed by Mariano Sapio, a successful entrepreneur who is celebrating the 50th anniversary of his awarded business activity, “Lavaigienico Sapio”, here at EXPOdetergo International. His laundry has become a point of reference to the entire Caserta province. “Half a century is a great result – he comments while dealing with exhibitors who have known him for years – and I can say I have accomplished it only due to the investments in technology and the quality of the service”. Mariano Sapio is a perfect indorsement of a show that claims to have been “updating the future”. Everyone here makes part of this goal. There are those who exhibit a machine eating a dirty carpet on one end so that it can come out clean on the other, a widely admired feature by a group of excited children as if they were at Gardaland; there are those who set up five o’clock tea rooms in order to demonstrate all the greatest features of a high-load washing machine to a group of women and their branded bags; there are those who, like Confartigianato and Cna, present all the online potential of the Sportello del Pulitintore (https://www.sportellodelpulitintore. it/) where it is possible to find solutions to described problems. Carlo Zanin, the President of Confartigianato Pulitintolavanderie and the Cna delegate, Francesco Lopedota together with Mr. Luca Bandiera, a lawyer, invite everyone… to the theatre. Talking about the future, the third day of the show starts with a comment by one of the exhibitors who confides: “I would like to see more entertainment or a show, one day. 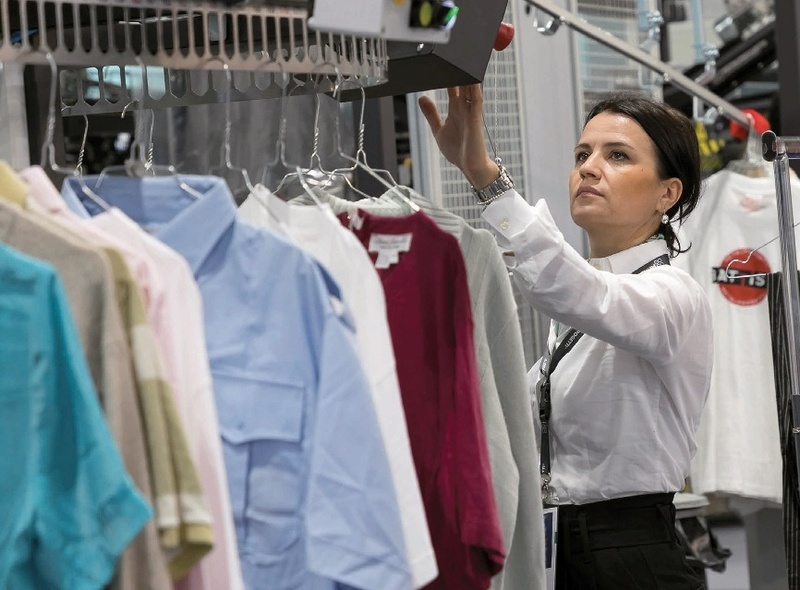 I have already talked with some clients who work in the fashion industry and I found out that they might find it interesting to participate in the next edition of EXPOdetergo International. 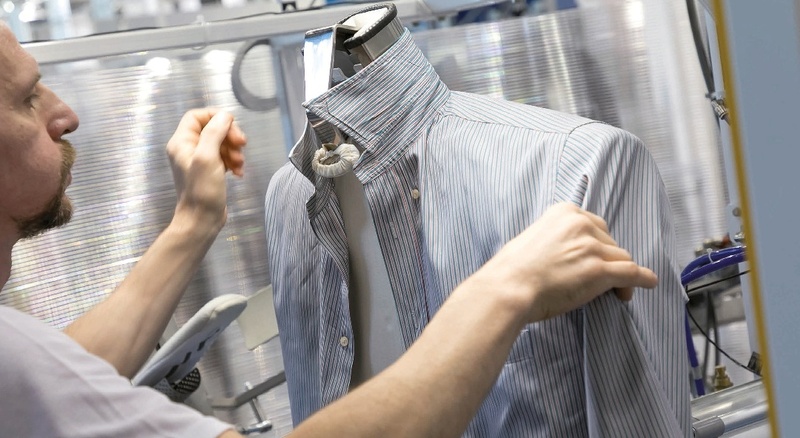 Today, the connection between textile itself and textile maintenance sector has become quite tight. As a matter of fact, if we consider Made in Italy fashion products, successfully exported all over the world, why would we hide this fact at an event like this?” Waiting for somebody to analyse these words and remembering that Texcare in Frankfurt organizes fashion shows during the exhibition (dedicated mostly to workwear), the city of pret-a-porter like Milan can only be considered comparable as far as shows go. The word, therefore, makes its debut on the third day of the exhibition. 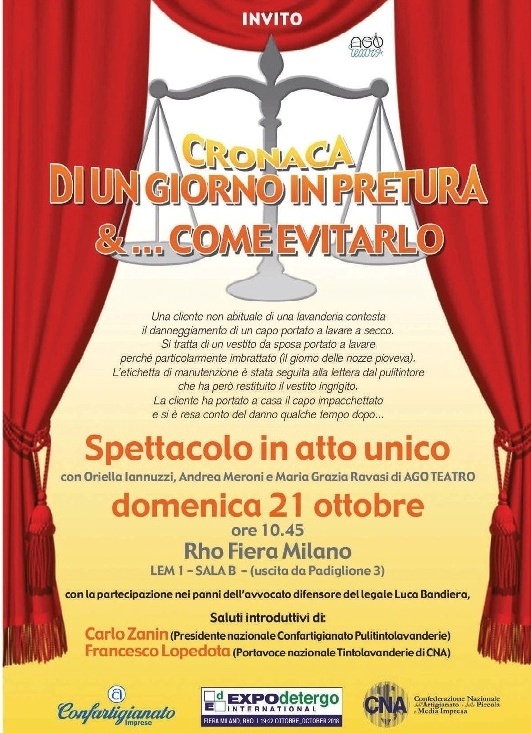 “Cronaca di un giorno in pretura &… come evitarlo” (A Chronicle of One Day in Court…& How to Avoid It) is a single-act theatre play by Ago Teatro theatre group. Exhibited in Lem1 room of the convention center, it was promoted by the Sportello del Pulitintore together with Confartigianato Veneto. The idea worked as the room was filled with people, mostly dry-cleaners. Somebody explains: “The soil, you must know, can be removed without problems. The important thing is not to remove a piece of fabric with it …”. Everyday truth is able to explain, first, the silence at the very end of the play followed by a strong applause to the joy of the organizer, Andrea Saviane from Confartigianato Veneto. The format of the play followed popular TV talk shows, e.g. “Forum” based on the idea of a judge and two parts quarreling. Also in this case, a judge is trying to manage a controversy between a mother of a bride, whose wedding dress has been damaged by a dry-cleaner, and the dry-cleaner himself. The two parties are divided by the garment tag that is supposed to explain things to those who buy a dress and those who wash it. As far as the wedding dress from the play goes, the lack of information on the garment washing procedures, having consulted specialists on the matter, pushes the judge to give a positive verdict in favour of the drycleaner. The shop has not been put in the conditions that would enable it to prevent the damage. The drycleaner is found not guilty. No compensation is going to be given to clients. Step by step, Mr. Bandiera, the lawyer and the consultant of the Sportello del Pulitintore, accompanies the audience by commenting on each passage of the play discussing the presented problems. All this is generously applauded by the excited audience who found this way of communication proposed by Confartigianato and Cna really interesting, clear and suitable. Keeping the message in mind, we go back to visiting the stands. We might be running into a few possible characters just like those represented by the talented actors of Ago Teatro a few minutes ago. Following some sort of a tradition, Sunday becomes the day of dry-cleaners visiting the show. They take advantage of a free day to come to EXPOdetergo International to check on the machines and products. Who knows what will the dry-cleaner, who came all the way from Lecce with his wife and a small child, think about the virtual trip inside a washing machine while wearing a helmet and an interactive “pistol”? 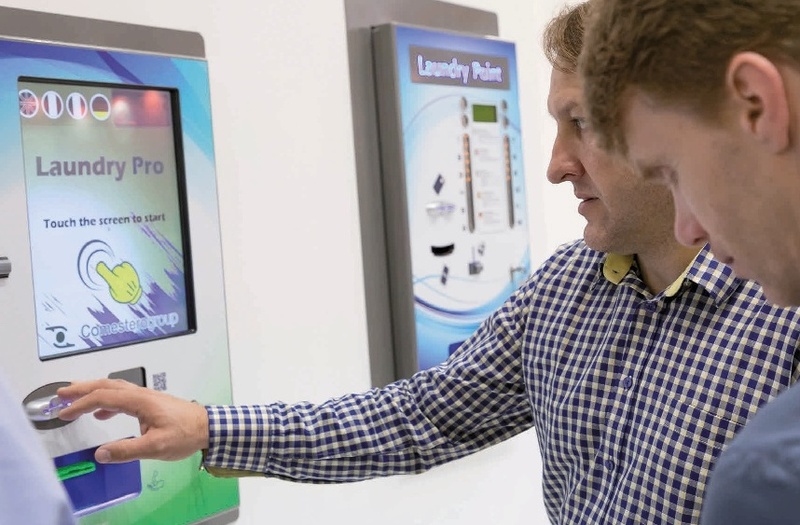 The virtual trip was organized by one of the industrial laundry machines producer. How about the live statues with their blue hair in front of a stand whose setting has been inspired by the ocean transparencies, sadly obsolete due to the global pollution? Because it is wonderful to be able to underline that this show can also offer, among various digital marvels, an ironing table to Mrs. Gina, a dry-cleaner who needs a new one after her twenty year- old ironing table broke down. Will it be the same in 2022? Will tunnel washers that look like space shuttles still co-exist with flatwork ironers produced by small, family-run and resistant artisan businesses? While waiting to discover it, we already know that, in four years, it will be crucial to attract visitors like e.g. Vincenzo, a-thirty-year-old man from Messina with his exemplary story. “I started ten years ago – he says – with just two 20 kg washing machines. I knew they would have to be enough although the request was high given the well-developed tourism sector and the local population. Today, my business covers a-400 employees sq. m. factory where I have several 120 kg washing machines operate. I employ 12 divided into two shifts. They also manage the ironing line”. 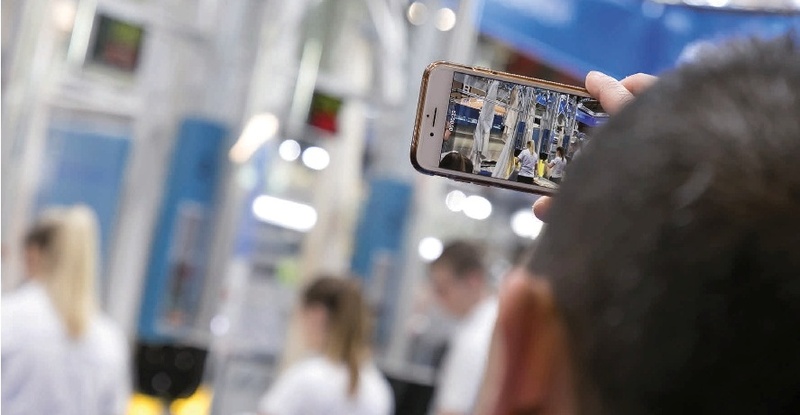 Also on the goodbye day, EXPOdetergo International can see the future being updated without leaving behind the two factors that make it credible: the human factor and the technological one. They co-exist everywhere we look. We can see them in the gratified expressions of young visual art communicators hosted by big multinational companies whose stands have become not just beautiful but outstandingly wonderful thanks to the images realized by these creative video makers. Images animated both by digital language and by poetic reminiscences. We can observe them in the tireless and much admired ironing performance of a laundry operator. She carried out at least a hundred and fifty live demonstrations of a tensioning ironing machine and its robotic power. Or perhaps in the Coex, a new fabric presented as “totally fireproof, biodegradable and hypoallergenic” by two companies that patented it and that assigned it to the marketing skills of Mrs. Lorella Primavera and her lucky name. These are all the signs echoed by the goodbye words pronounced during the final toast. 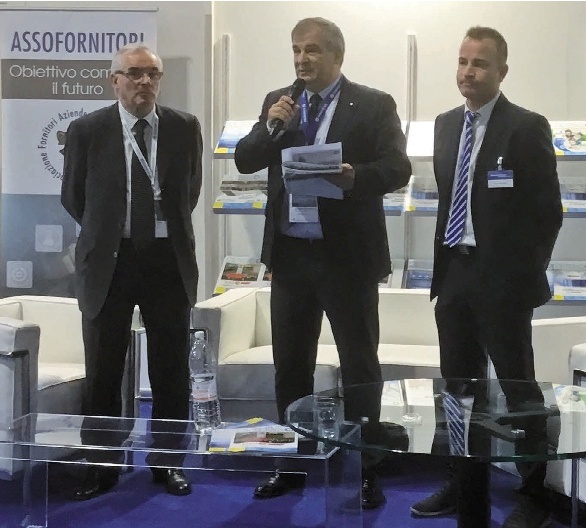 “All the exhibitors and their spectacular and innovative stands contributed to the beauty of this exhibition” commented Livio Bassan, the President di EXPOdetergo International. “We can only be very content about the accomplished result” echoes Felice Mapelli, the President of Assofornitori. “The success is due to a lot of hard work and big doses of creativity” adds Alessandro Rolli, the Executive Director of EXPOdetergo International. 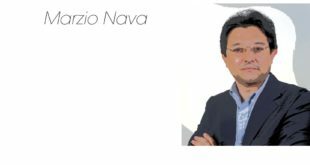 All the expressed concepts are reflected in the words by Giuseppe Garri, the Exhibition Manager at Fiera Milano: “EXPOdetergo International is an outcome of an extraordinarily associative work and Fiera Milano can only be proud to host it”. See you in 2022.